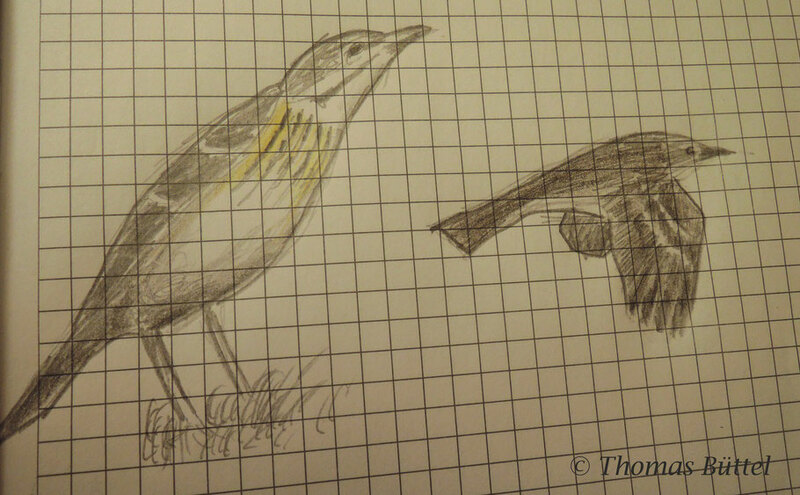 As already mentioned in my last blog post, I´ve seen a weird pipit with features of a Richard's Pipit. Especially its stature and behaviour indicated this species. Richard's Pipits are seen regularly at the coast during October and November with a few individuals flying far into the inland sometimes even to Bavaria. It is however often only detected as a fly-over and then identified due to its characteristic sparrow-like call. Afterwards a car flushed the pipit and I wasn´t able to find the bird again in the dense grass. However it revealed to be pretty long-tailed and -winged. The wing tip was rather broad with the four outermost primaries being almost equally long. Concerning only the common pipit-species I quickly came to a Richard's Pipit because the pattern of the breast doesn´t fit to any other pipit I know of. Still it must be taken in account that I have no practical experience with this species by now and that the yellowish tone of the breast is rather uncommon too. Nevertheless I would be grateful for any comment about this bird.